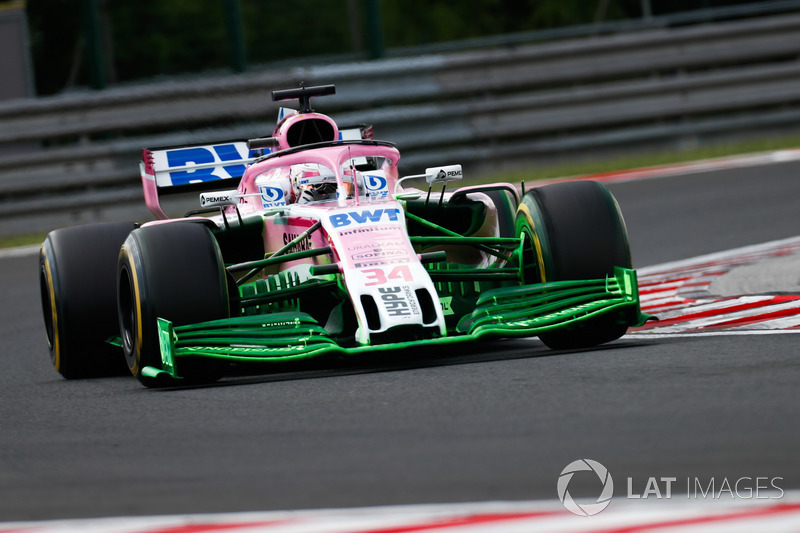 Force India has been punching above its weight from a technical point of view for a number of years, but a budgetary crisis – resulting in a mid-season ownership and name change – and the introduction of the halo had serious ramifications on its aspirations in 2018. 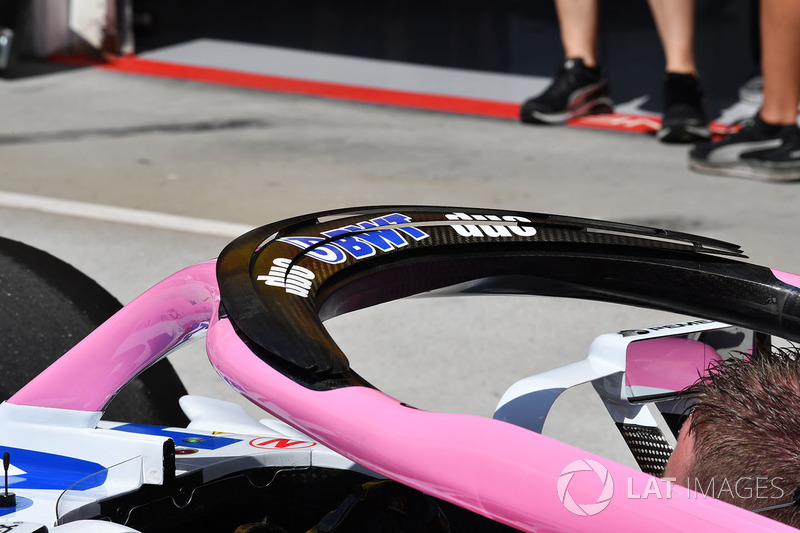 Force India’s technical director Andy Green was keen to point out that the introduction of the halo couldn’t have come at a worse time for the team, as without it Force India would have surely carried over its 2017 chassis and reaped the development rewards elsewhere. 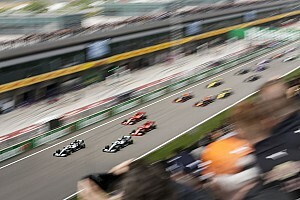 However, the safety structures inclusion meant that was impossible and a new design was needed, siphoning off much of its limited resource and budget. 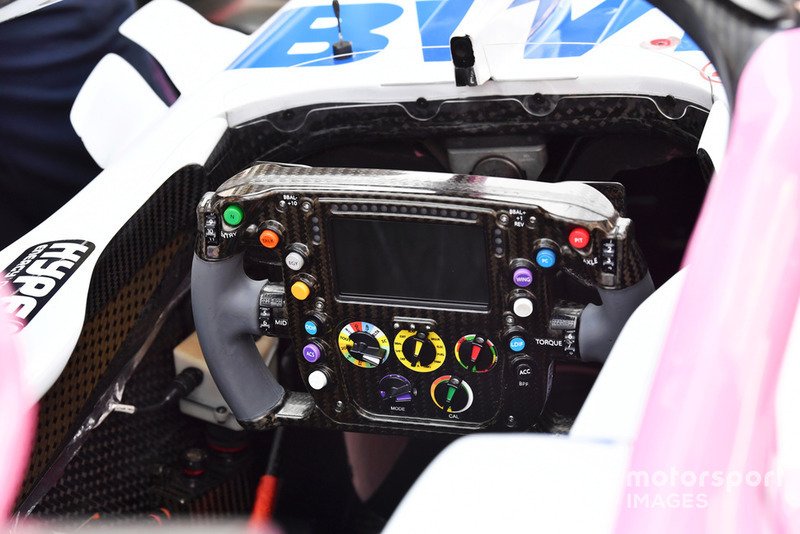 An overview of the VJM11’s steering wheel, the surfaces of which were made from carbonfibre during this season, rather than the 3D printed variations used in the past. 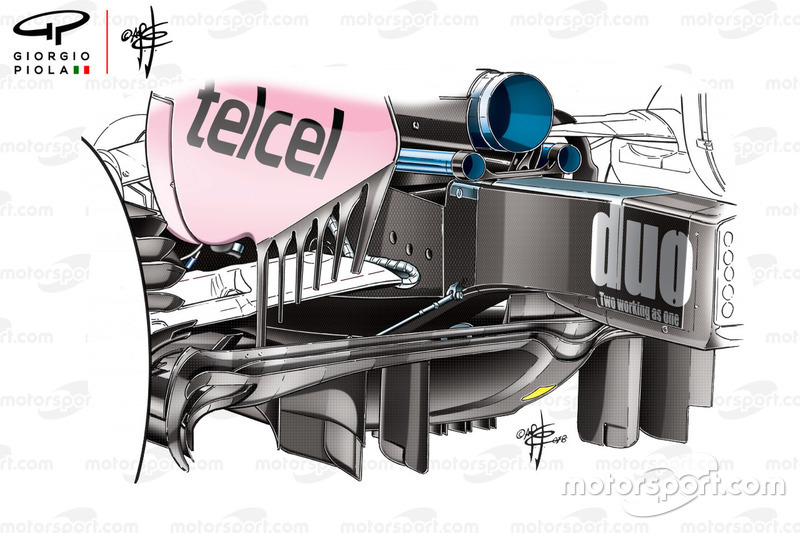 A good look at the VJM11’s rather tidy rear end, note how the lower wishbone shrouds also cover the driveshafts. 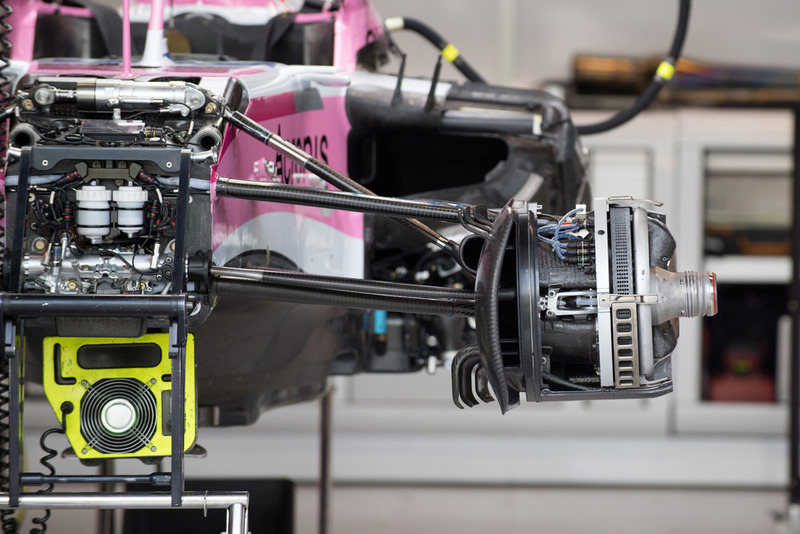 A look at the front brake assembly as the car is being put together, note the mental venting panel, used to alter the thermal relationship between the brakes when in use and the wheel rim which is in close proximity. 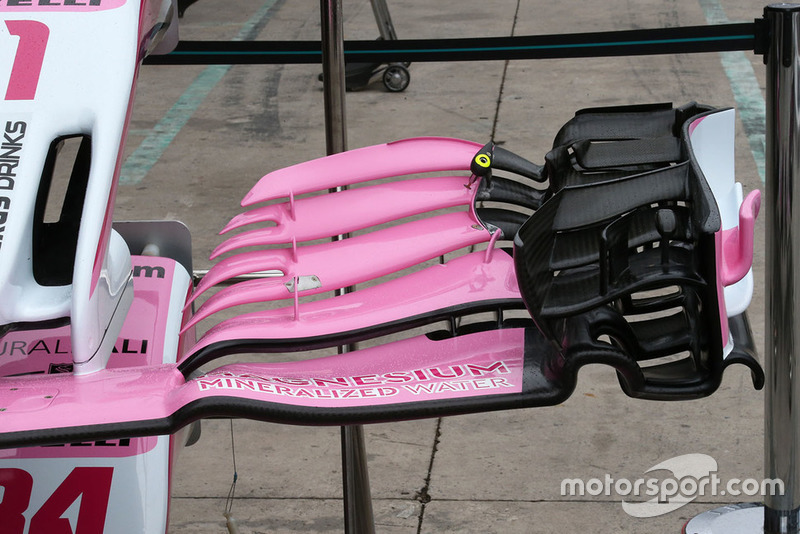 The VJM11’s mirrors extended out from the top surface of the sidepod on these ‘stalks’ that also doubled as vortex generators; note that the cockpit arm was latterly deleted. 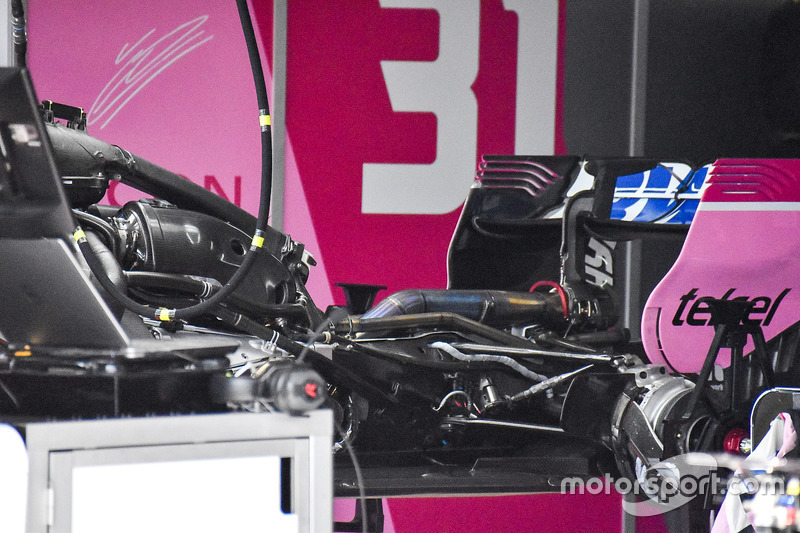 A good look inside the bowels of the car with the engine cover and sidepod bodywork left off gives us an insight into the way the car is packaged. 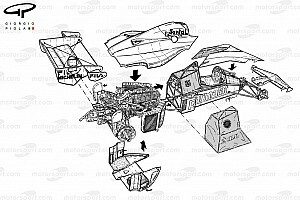 This top-down overview of the VJM11 at the pre-season test in Barcelona shows off the base configuration of the car. 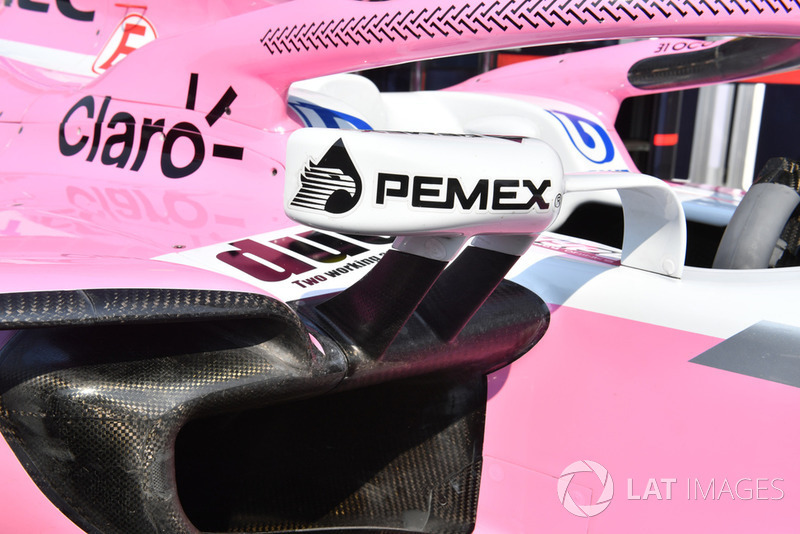 Seemingly struggling with the design of the sidepod bodywork in the opening phases of the season the team adopted this little winglet at their base for several races. As it struggled to wrap its head around a few of the problems during the early phases of the season they opted to spray the diffuser with flo-viz in Azerbaijan, looking for any indications of aerodynamic issues. 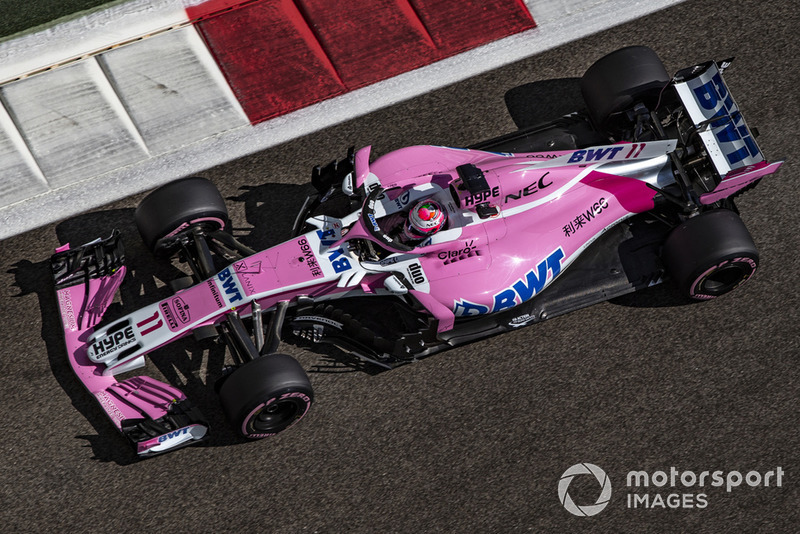 The team unveiled a new front wing design in Bahrain, but with only one available and other parts delayed they didn’t actually race it until Monaco. 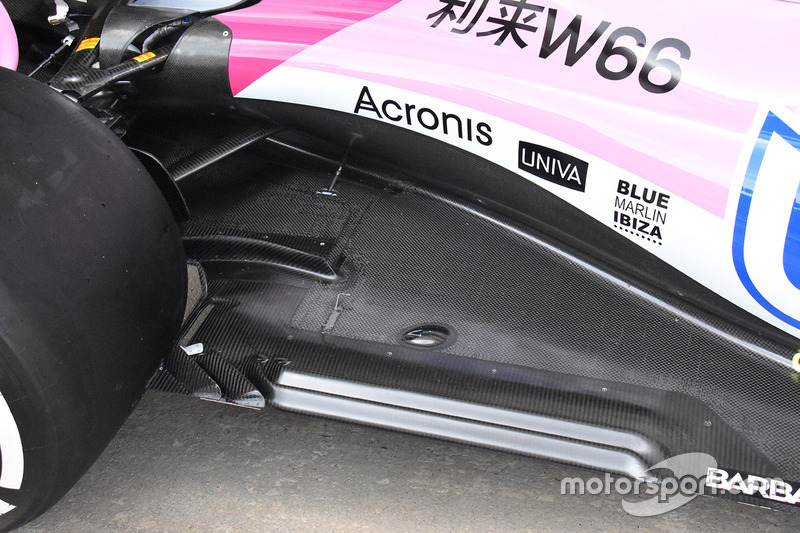 The main feature of the new wing was the rolled up main-plane profile where it met with the neutral section, designed to alter the vorticity created at the Y250 juncture. 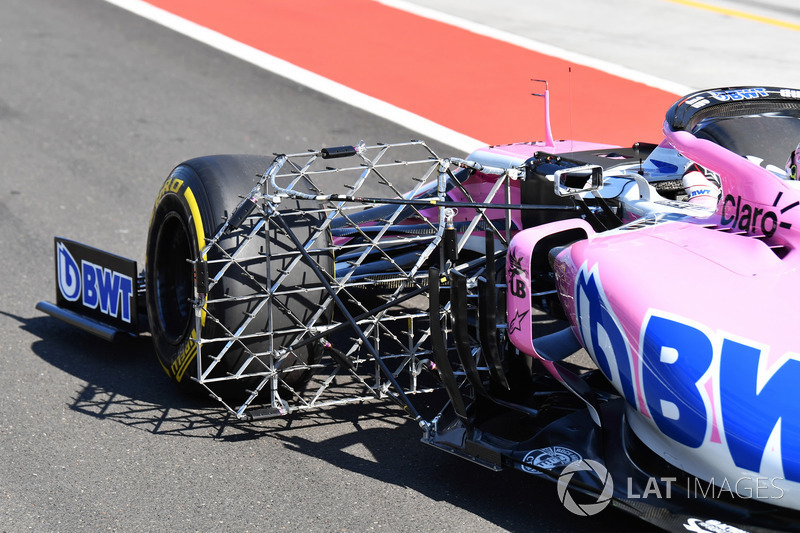 The team introduced a new, more complex, diffuser at the Chinese GP which included the crossover style tab in the gurney section that has become popular up and down the grid. 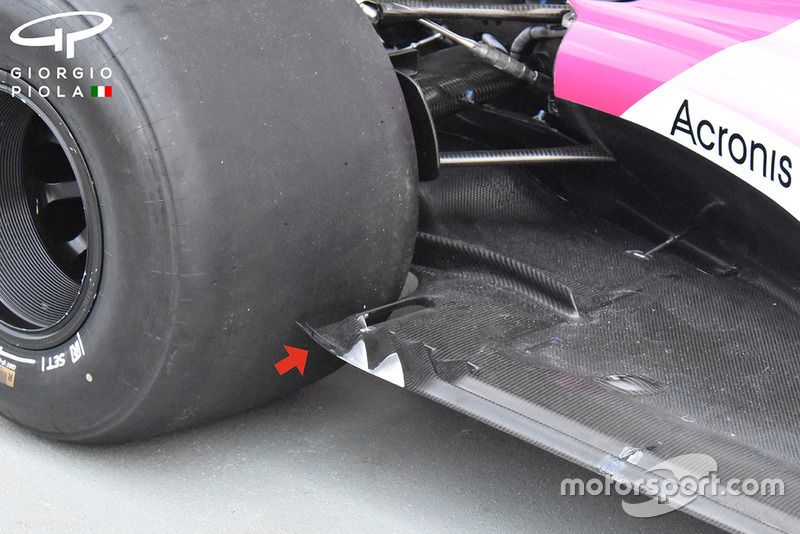 The team, like much of the field, adopted these longitudinal floor slots at the Spanish GP, with the intent of sealing off the floor's edge, aerodynamically speaking. 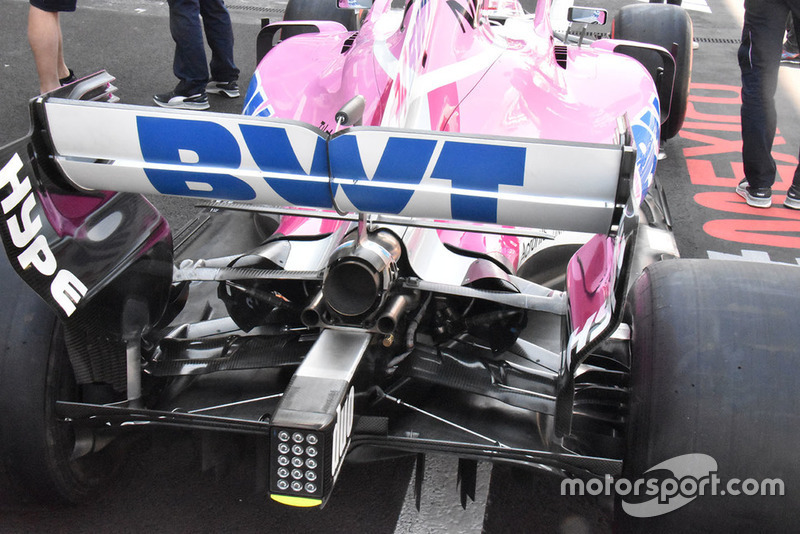 An interesting testing device was mounted to the rear wing at the in-season test at Barcelona, as the team looked to capture more data on the interaction between the exhaust and rear wing (note the temperature strips in the central portion of the device). 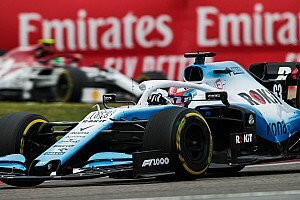 Looking for more rear-end performance for the Hungarian GP the team adopted the same pair of twin element T-Wings used in Monaco. 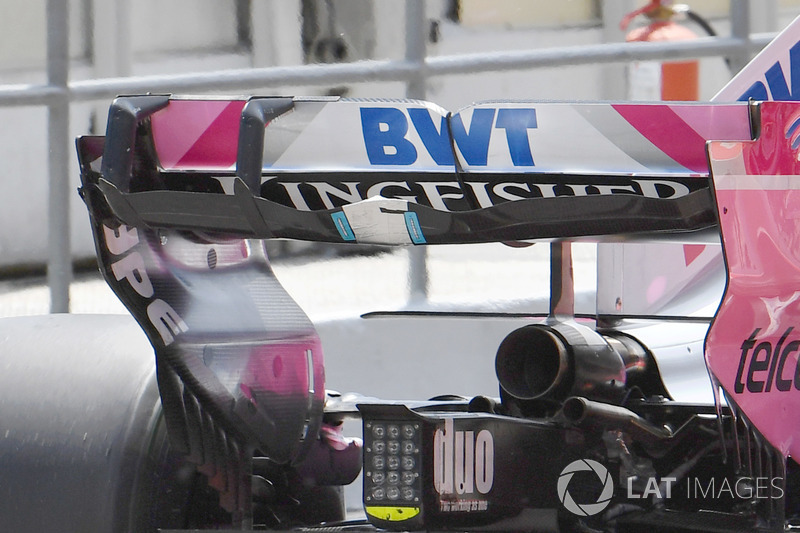 Force India were among a handful of teams to trial a 2019-style front wing during the season, complete with flo-viz paint in this example from the in-season test at Hungary. 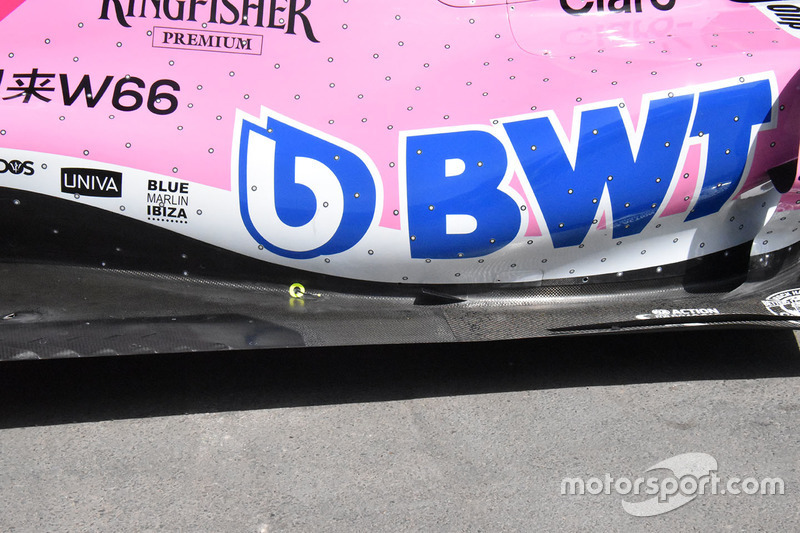 They also looked to collect important information during the test regarding the wing’s impact on the flow field, installing a kiel probe array behind the front wheel. 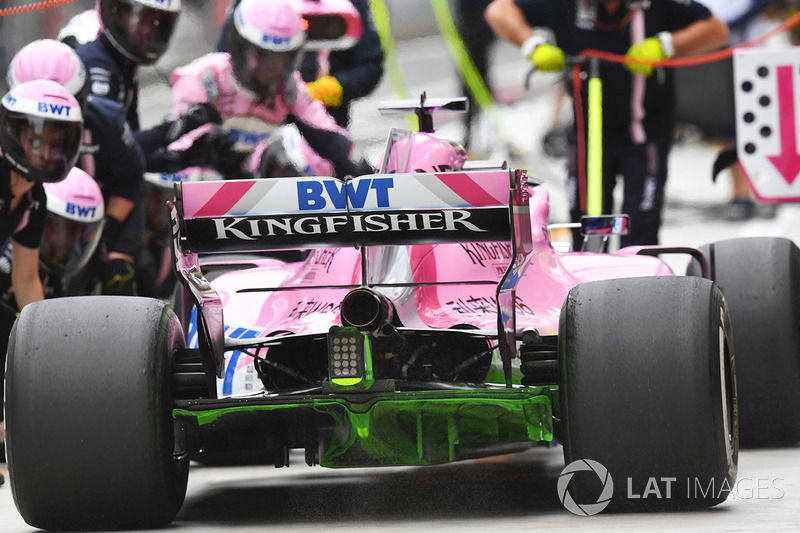 The team had a large portfolio of new parts at its disposal in Singapore, as it showed the first signs of delivering on the cash injection. 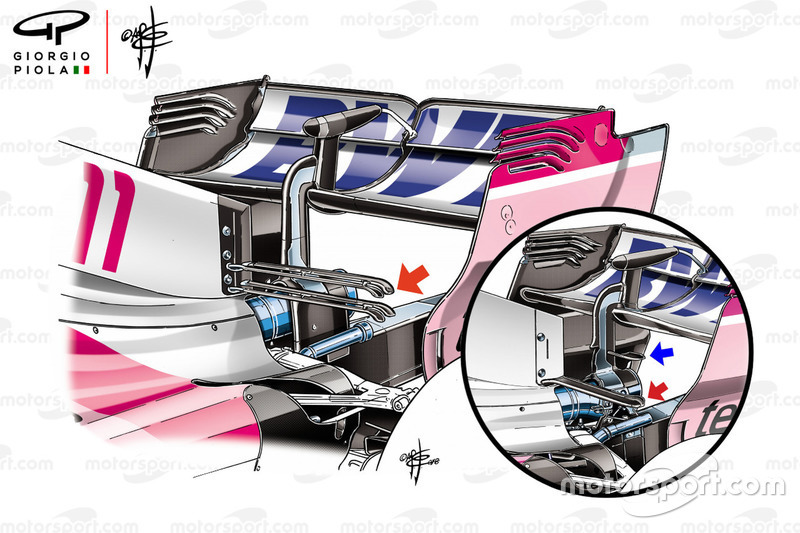 The new bargeboards featured a new overarching leading element (inset, right, for comparison), while the floor’s leading edge strake number was doubled, from three to six. 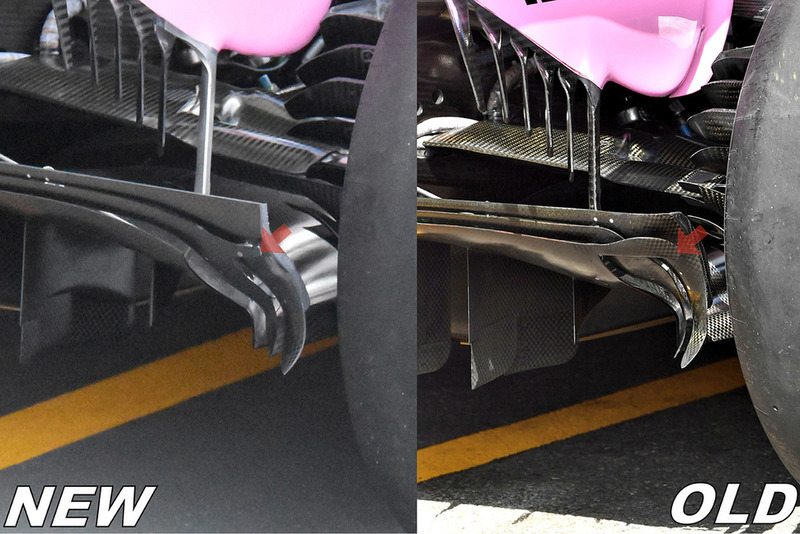 A comparison showing the new diffuser from Singapore, the red arrow highlighting the change in the crossover tab. 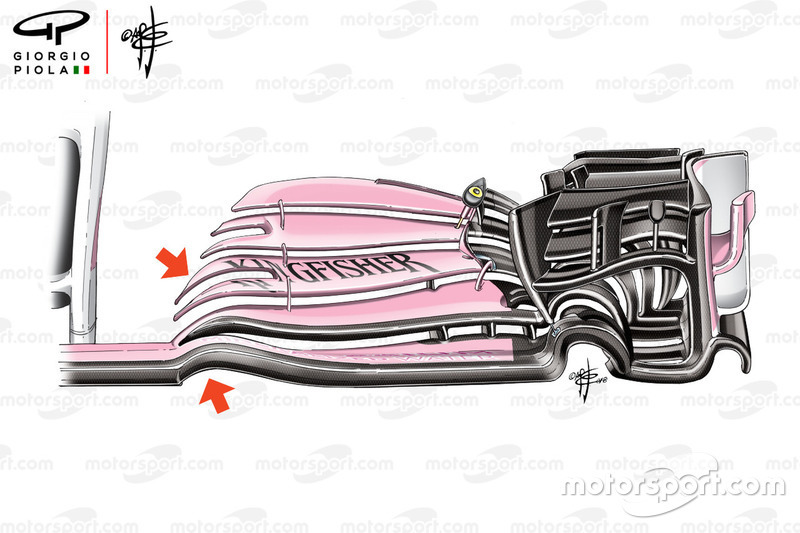 The team revised its floor ahead of the rear wheel, slightly upturning the edge and adding a flap too (red arrow). 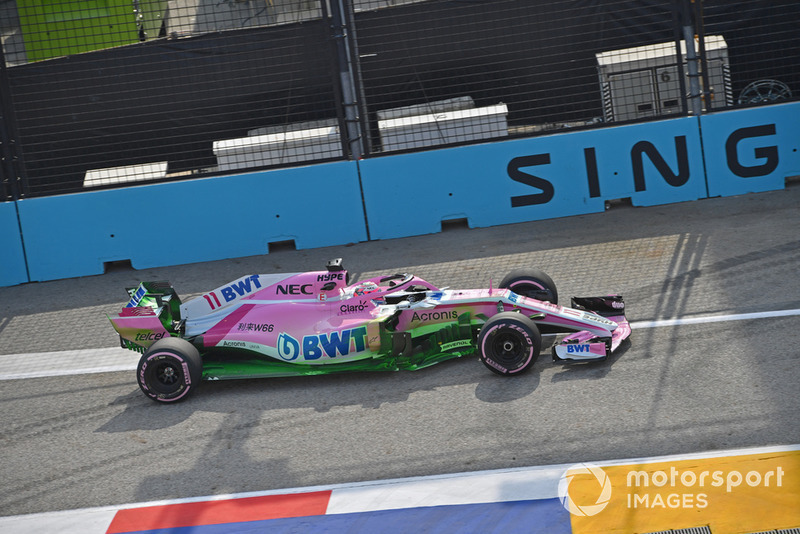 The VJM11 was sprayed with flo-viz paint in Singapore in order to check that track performance was in-line with the results shown in CFD and the windtunnel. 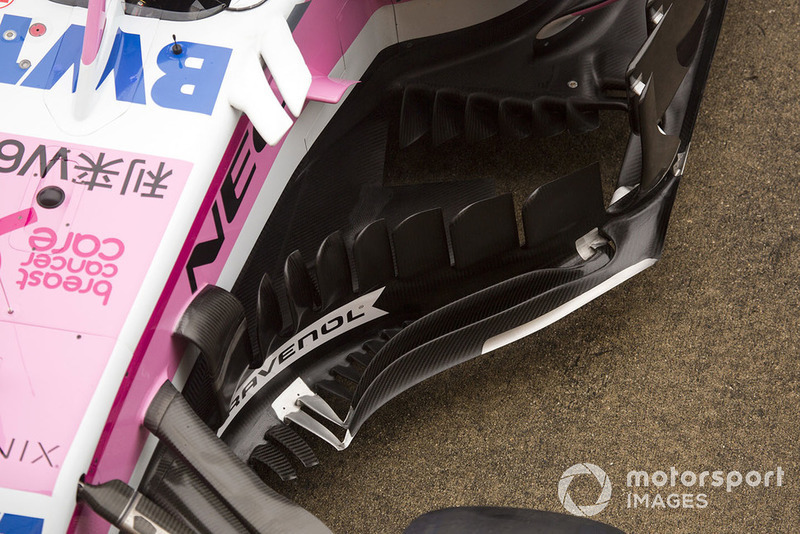 A nice overview of the bargeboard and floor region at the Japanese GP, note the six strakes on the floors leading edge and the plethora of serrated elements in the bargeboard’s footplates, which changed throughout the season. 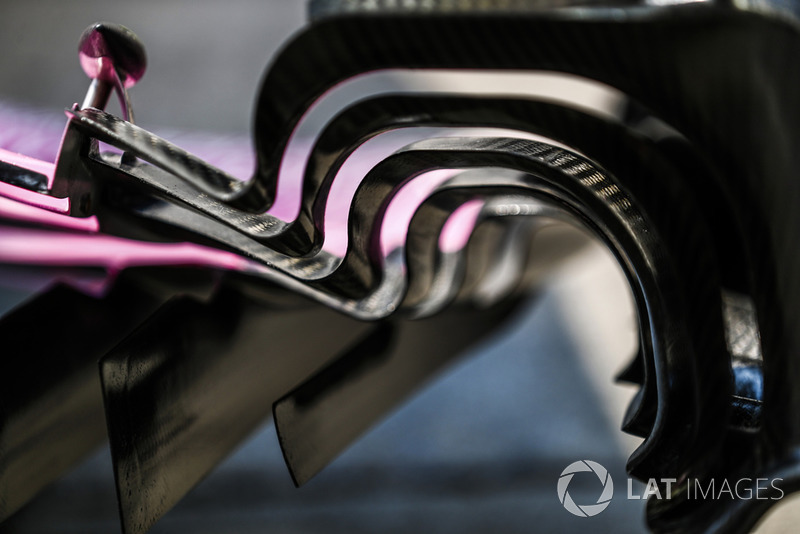 A close-up of the front wing, a descendent of the newest specification that took almost the first quarter of the season to get onto the car. 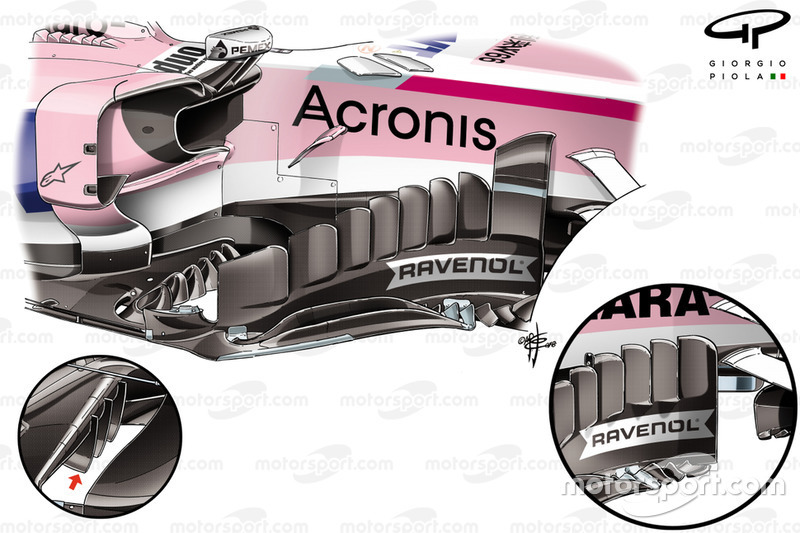 You’ll note how the main plane and flaps are torturously folded into a tunnel-like shape in the outboard section that helps to drive airflow out and across the front tyre. The aforementioned ‘tunnel’ shot from behind. 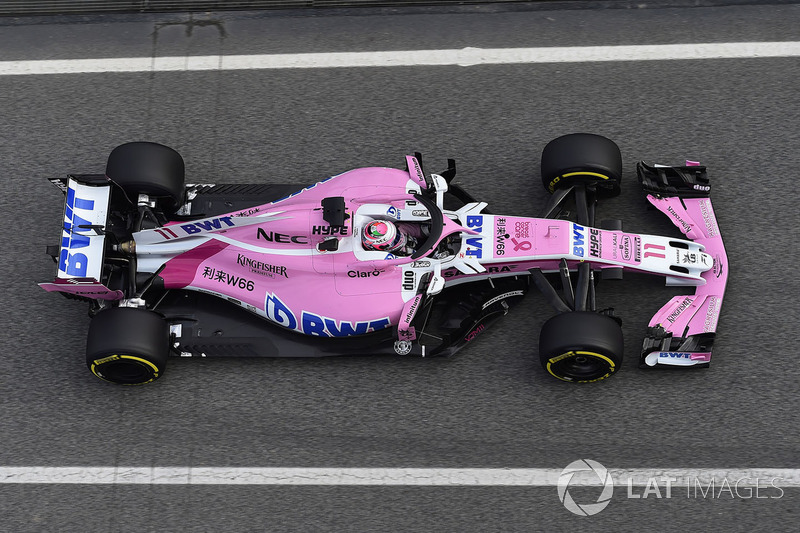 Retiring the VJM11 at the end of the season, along with that naming lineage, the team has since admitted that it missed a development step as their budget got stretched ever thinner during the middle of the season.